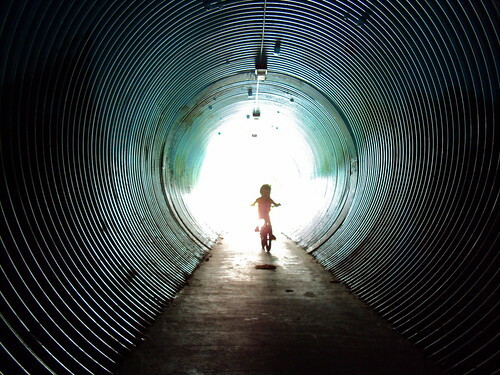 Tunnel! 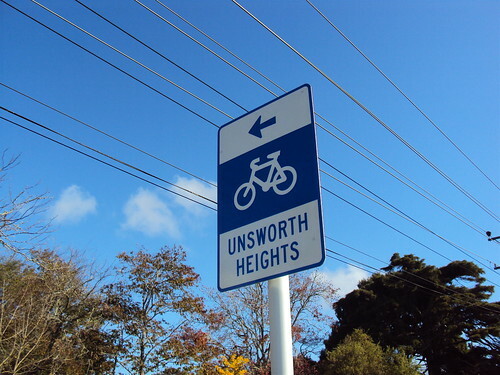 The key link between Unsworth Reserve & Rosedale Park. Motorways work well for moving cars around, well until rush-hour hits. The problem is they tend to slice-up a city, dividing neighbourhoods with physical barriers that can only be crossed in a select few places. The Northern Motorway effectively cut the North Shore in two when it was bulldozed through. One of these “divided-neighbourhoods” near my home is the Albany Industrial Estate. What was farmland not so long ago is now packed with industry, sports fields, a swimming pool, BMX track, cafés, bars and restaurants. 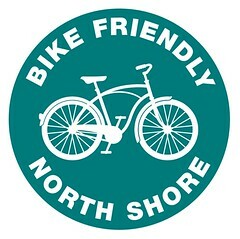 There’s even a bike shop, but with the Northern Motorway to the east and the the Upper Harbour Highway to the south it’s a mission getting there by bicycle. 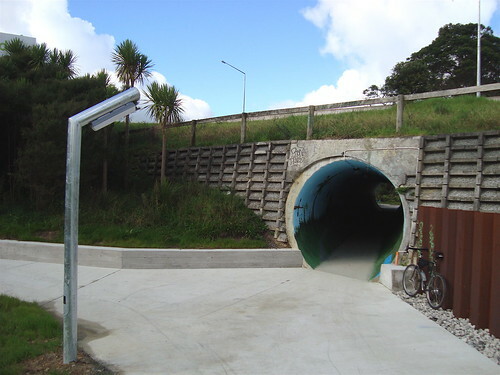 “Why don’t you ride through the tunnel” an acquaintance said to me. “There’s a tunnel? I’ve never seen a tunnel? Whadaya mean there’s a tunnel?” came my gob-smacked reply. So I grabbed my camera and departed in search of this mystery excavation under the highway. 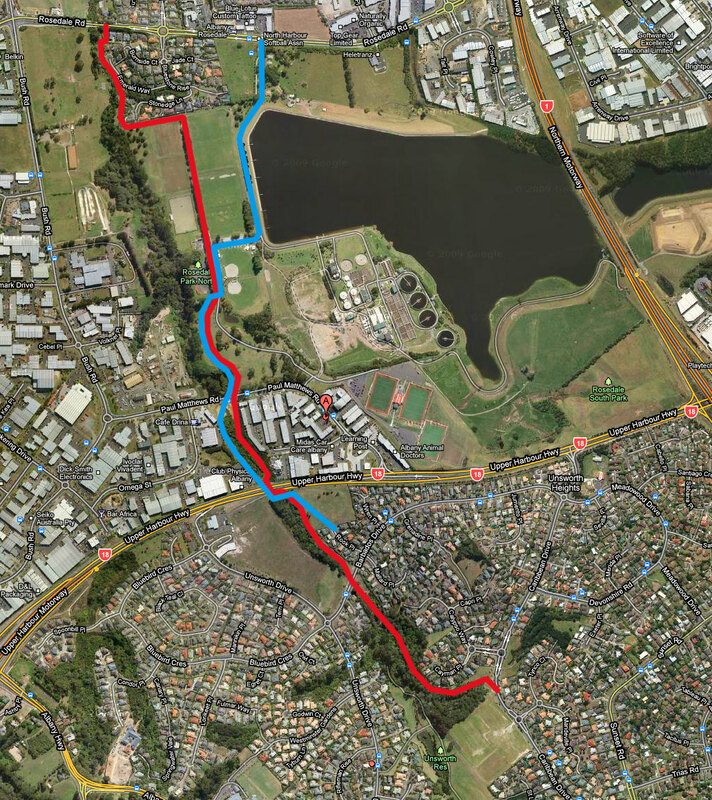 Paved route marked in blue, off-road in red. 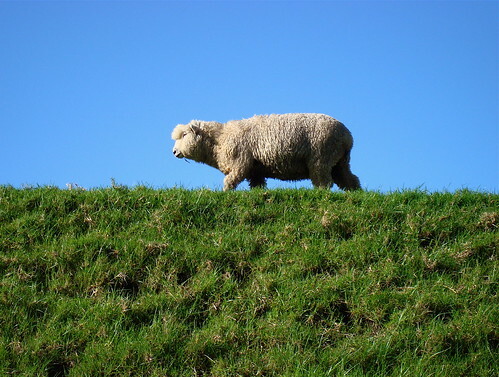 Unsworth Reserve. Hard to believe this is in the middle of suburbia. What I discovered was a route that took me from Sunset Road halfway to Albany. You can stick to the hard-top, but what really got me going was by joining up the parks and greenways I could virtually ride the whole thing off-road. I’m a mountainbike-tragic so even my road-bike was sporting knobblies on this occasion. That was fortuitous as I encountered some muddy stretches in the bush and the grassed areas were extremely waterlogged. No trouble on a mountainbike of course, but I wouldn’t be wearing white shorts if I was you. In summer, when the grassed areas are firm, almost any bike would do. Some suburban plumbing intruding on the natural beauty. If you’re on a road-bike, don’t want to get dirty, or have young children in-tow, start at the end of Rook Place in Unsworth. 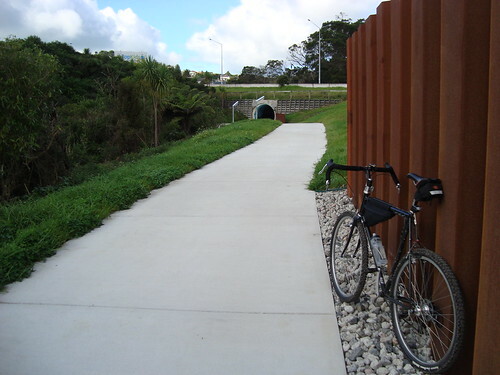 There is a new “share-with-care” path from there that leads down to the tunnel under the Upper Harbour Highway. 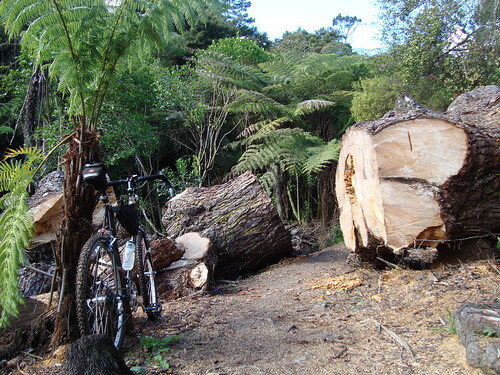 This is sealed with some sections of boardwalk and emerges on Paul Matthews Road. Cross Paul Matthews carefully and you join-up with another new path that glides across Rosedale Park down to the car-park at the softball diamonds. From there you can follow the road beside the poo-ponds (water-treatment reservoir) past the pony-paddocks to Rosedale Road. This a busy stretch of tarmac in the weekend with softball, hockey and football matches in progress, but a series of speed-humps keeps the cars restrained to some extent. Share with Care path leading from Paul Matthews Road. Tunnel under the Upper Harbour Highway. Who knew? 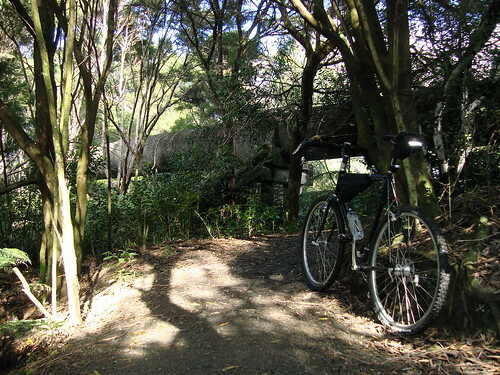 The most enjoyable part for me was riding through Unsworth Reserve. There’s a concrete path hugging the western edge of the trees that enters the bush and turns off-road at its northern end. 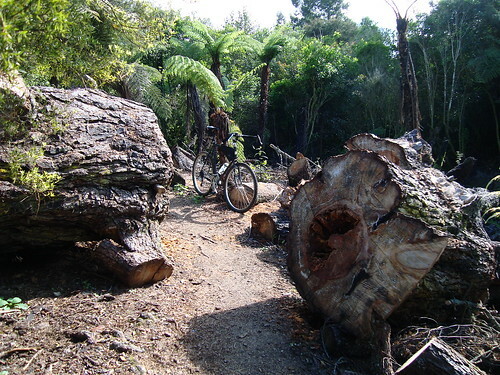 That’s a pleasant enough ride but if you have some trail-riding skills (or don’t mind pushing over sections of slippery tree roots) make your way over to the eastern side and a lovely track leads you into the heart of the bush before emerging again at Barbados Drive. Cross Barbados and a gravel path takes you down to the tunnel. What a shame previous councils didn’t ‘reserve’ more of these little pockets of heaven as the Shore was expanding. You are within spitting distance of housing and commercial buildings in those trees but you could be in the middle-of-nowhere. After crossing the carparking area beside the softball diamonds I kept with the “off-road” theme and rode straight ahead between the hockey and football fields. In the far left corner is yet another greenway and by following your nose you will eventually get to Rosedale Road. 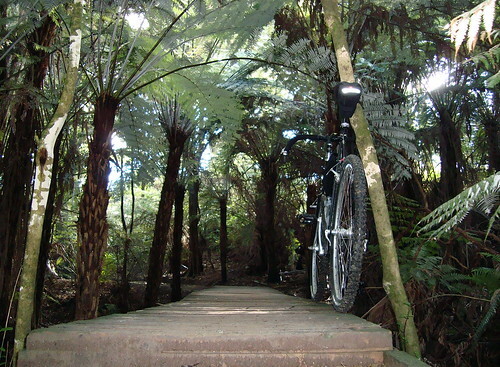 From Rosedale you could ride up Bush Road for a little mountainbiking at The Royal Albany Trails or explore the greenways at the base of the scenic reserve. These run in both directions from Bush Road but you’ll have to duck down some residential streets to access them. 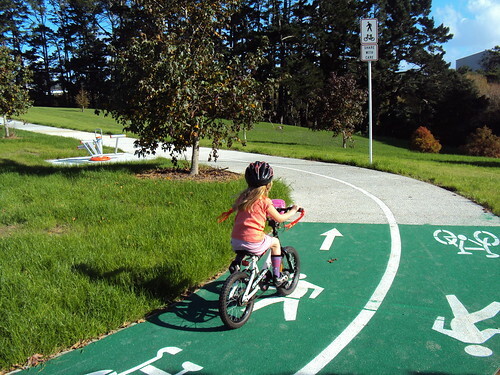 I took my five year old the next time I visited and she had no trouble riding the paved route on a singlespeed BMX. Great family-fun and a safe short-cut between suburbs that I suspect is only known to the locals. Rosedale Park 'Share with Care' heading toward Paul Matthews Road. Sean (and friends) mowing the water-treatment pond surrounds. The paved sections are sign-posted from Rosedale Rd.